The only thing I knew previously about my paternal grandmother’s father was that she claimed he was the first certified public accountant in the state of the Alabama. I still don’t know if that’s true or not. The pictures of the family that my dad left me show a very stern man, almost frighteningly so. Albert Steward Stradford is, in all of them, wide-eyed and without a smile, well-dressed and sitting upright, with hair neatly combed and well-groomed thick moustache. Albert Stradford’s parents, William P. Stradford and Louisa (Mayhall) Stradford, were married in 1852 and lived in north Alabama. Albert was their youngest child, born in 1873. The 1860 census lists the couple living in Morgan County, Alabama, with three children: a daughter named Sidney, age 7; a daughter named Martha, age 5; and a daughter named Louisa, age 1. Having been born probably in 1853 and 1855, Sidney and Martha were 20 and 18 years older than their youngest brother. Then the 1870 census has William and Louisa in Colbert County with five children: Sidney, now 16; Martha now 14, and Louisa, now 10, followed by Matthew, age 7, and a one-month-old baby named Robert. Little Robert does not appear again, so I am guessing that he must have died as a baby. His name listed in 1870 couldn’t have been a misspelling of Albert, because my great-grandfather wasn’t born until 1873. Also living with the family were three boarders who all appear to work for the railroad. What a crowded house! A married couple, five children ranging from 16 to newborn, and three railroad men! The earliest document I can find that lists my great-grandfather is the 1880 census, which has him living with his parents, seven years old. The family is living in South Florence in Colbert County, Alabama, which just south of the river between Florence and Muscle Shoals. His father William is again listed as a “bridge keeper,” which makes sense since they live right by a river, and his mother Louisa is “keeping house;” they are 46 and 47 years old, respectively. Also there are his older sister Louisa Stradford (who is alternately called Lula) and his older brother Matthew T. Stradford, ages 20 and 17. No occupation or notes about school are there about his siblings. Interestingly, following the columns across the page, William Stradford’s parents are listed as coming from England (father) and Virginia (mother). Once again, I can find no sign of the 1890 census. I’m thinking at this point that the 1890 census hasn’t been digitized or wasn’t done properly. In doing the research on several of my relatives, the 1890 census is always what’s missing. 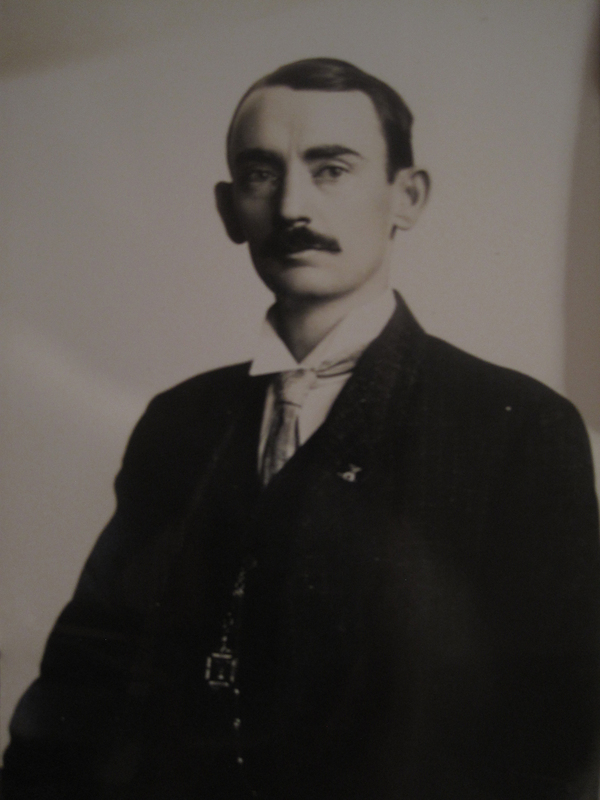 Nonetheless, in 1890 Albert Stradford would have been about 17. By the 1900 census, Albert is married to Louisa (Davis) Stradford and their oldest child, Carl, is half-a-year old. (They were married in April 1895. Oddly, he married a woman with the same name as his mother and his sister.) The young family is living in Birmingham now, at 1522 17th Street North. Two things about this record stand out to me: both Carl’s and Louie’s mothers are listed as being born in Mississippi – so Louie was from Mississippi – and Albert’s occupation is “Chief Deputy Sheriff.” So was he in law enforcement? Sadly, next to Louie’s name in the columns about children, she is listed as being the mother of two children but of one living child. My dad’s records list a child named a child named Ernest who died in infancy, and this record verifies that. The 1902 city directory for Ensley, Alabama, which I found on Google Books, lists “Albert Stradford” as Chief Clerk to the Sheriff AW Burgin. Ensley is a community on the outskirts of Birmingham that was originally a mill town created by a steel company. This clarifies the law enforcement question; the census taker omitted the word “clerk in my great-grandfather’s column . . . or maybe there just wasn’t room, I don’t know. In the 1910 census, there are Albert and Louie Stradford, in Birmingham at the same address, this time with two children, Carl and Dorothy. Now, Louie’s sister Ursula Davis is also living with them. Albert’s occupation is assistant auditor with the “City Gov’t,” and once again Louie has no occupation listed. (This time, all references to Mississippi are gone, and Alabama appears in all columns.) Ursula, who is 30, has an occupation listed as “advertiser” at a “Dry Goods Store.” Carl is 10, Dorothy is 7, and my grandmother Alberta should have been on the way. My great-grandfather’s World War I draft card lists him as a deputy tax collector who works at the Birmingham courthouse. The card lists his address still as 1522 17th Street North. He is described there as tall and slender, age 45. It doesn’t appear that he applied for an exemption, like my great-grandfather Ed Taylor did, though I’ve found no evidence that he served in the war. This photograph was probably taken in the mid-1910s. 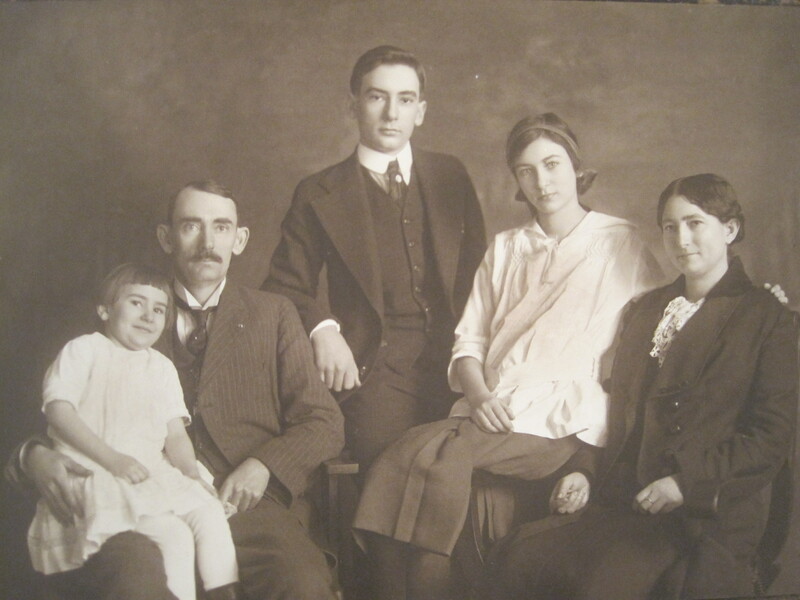 I make that assumption since my grandmother – the little girl in her father’s lap – looks to be about four or five years old, and she was born in 1910. At right is my great-grandmother “Louie,” and my grandmother’s siblings Carl and Dorothy are in the middle. A 1926 city directory for Birmingham inclines me to think that Albert Stradford as a busy fellow at age 53. In city directories, a man’s wife listed next to his name in parentheses – and Louisa’s name is right with his – then his occupation and place of employment, followed last by his residential address. In this case, my great grandfather is listed as Secretary Treasurer for Enterprise Engraving Company, treasurer for Alabama Limestone and Stone Corporation and as having an accounting office on 1st Avenue North. The entry lists their address still as 1522 17th Street North. In the 1930, Albert and Louie Stradford are living in Birmingham. He is listed as an “Auditor” for “General Public,” and rather than “keeping house,” which is the common notation next to most married women’s names, Louie’s says “Practitioner” at “Scientist Church.” This census would have been taken about a year before her death. My dad had told me that his mother was a Christian Scientist, but it’s remarkable to me that her mother – my great-grandmother – has it listed as her occupation in this census. Neither Albert Stradford nor his wife Louie would appear in anymore census records, since he died in 1938, and she died in 1931. Their youngest daughter married my grandfather, Herbert Coleman Dickson, in 1937, so Albert lived long enough to see his youngest child get married. My dad never would have known either of his maternal grandparents, so there weren’t any stories to tell. Yet, the census records, city directories, and other records tell a definitive story of a man who appears to have been good at what he did – accounting – since he had an array of prominent clients in the public and private sectors. Though I still know absolutely nothing of his personality, his likes or dislikes, his nuances, his ideas. He has been reduced to a name in scattered records, accompanied by a smattering of photographs, showing him only with a cold visage. Maybe that’s who he was. Truthfully, I may never know . . .